The best, weirdest places around Austin aren't reallyto be weird. They're more focused on following their own spirit. They don't care about trends; theycare about creating and sharing something that they love. You'll see the slogan "Keep Austin Weird" pop up everywhere around this town, but what does it really mean? 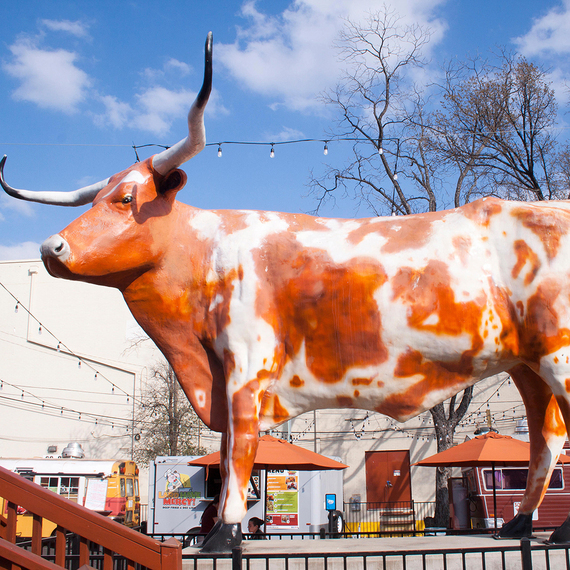 Here's my take: The best, weirdest places around Austin aren't really trying to be weird. They're more focused on following their own spirit. They don't care about trends; they do care about creating and sharing something that they love. Some believe that “weird Austin” is synonymous with “old Austin” -- that anything new is too corporate, too hipster or (the horror) too “Dallas.” But weird knows no age. You can find it in both Austin mainstays like Lala's and relative newcomers like Fantastic Fest. Weird isn't necessarily gaudy or fun-loving; sometimes it's as serene as Casa de Luz. If all of that sounds a little woo-woo, that’s because this weird, great town has rubbed off on me. Go find your own weird Austin. The five ideas on this list can serve as your starting point. All of the new, artfully designed bars in Austin, with their artisanal cocktails and such, are well and good, but there's just something about a dark, neighborhood bar that's been open forever--and leaves its Christmas decorations up all year long. Stop in for a drink and holiday cheer if you're shopping in the Burnet Road area. As condos spring up around Barton Springs Road, nearby Casa de Luz just keeps doing what it's always done: serving up three vegan, organic, gluten-free meals daily, along with a peaceful community spirit. Besides dining here, you can take yoga, tai chi and other classes, or just enjoy the gardens. South Congress Avenue may be better known, but North Loop Boulevard is one of the current epicenters of weird Austin spirit. You'll find lots of local, offbeat businesses there, including Room Service Vintage. Wander through this colorful maze of retro treasures and collectibles to find a one-of-a-kind Austin souvenir to take home. Since 2005, Austin has played host every September to what might be the weirdest film festival in the country. Based at the Alamo Drafthouse movie theater’s South Lamar location, Fantastic Fest focuses on horror, fantasy, cult and otherwise fantastical films. The weirdness isn't just onscreen, though: The fest is known for its special events, like debates that turn into boxing matches.